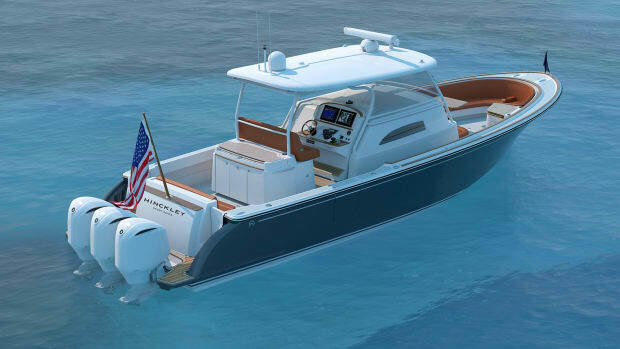 The builder’s first center console with outboard propulsion helps redefine what it means to be a Hinckley. 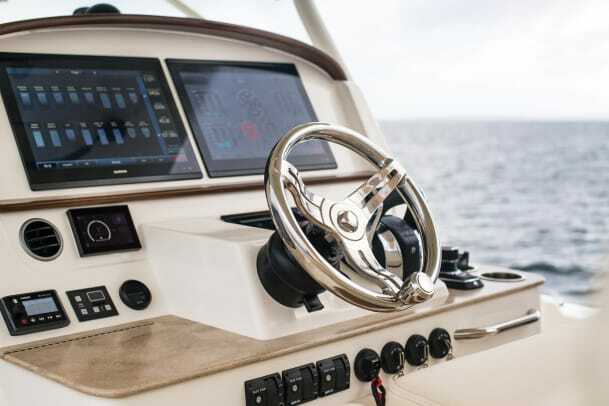 The center console segment has been picking up a lot of horsepower in recent years as more builders launch boats over 40 feet with several outboards gently rumbling on the transom. And while there are new models from companies you’d expect to see in this segment—those with deep roots in offshore fishing, for instance—there are surprises, too. 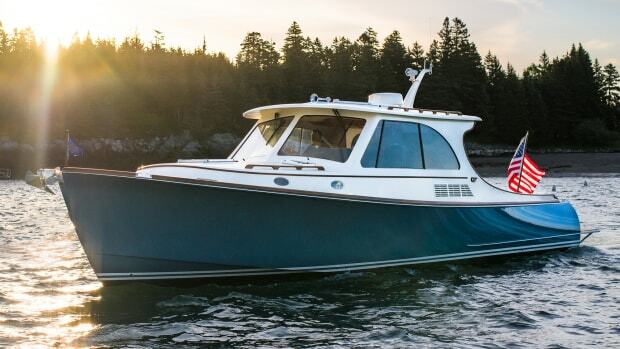 The Sport Boat 40c by Hinckley is one of them. 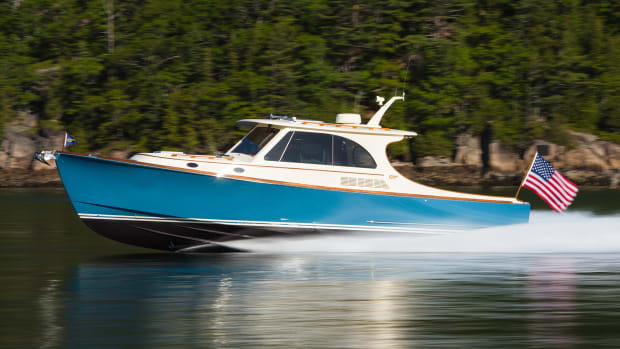 This Maine-based builder is perhaps best known for its jet-powered, lobster-style Picnic Boat series, and the company made waves last year with the fully electric Dasher. 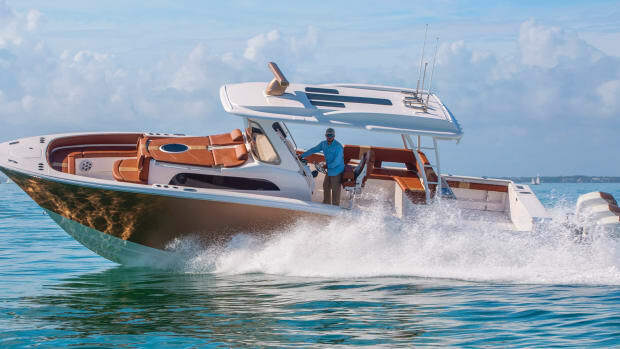 The 40c, though, is a different animal—a fast, open boat with high-performance motors that’s designed to make it possible for an active family to have a big adventure within the span of an afternoon. 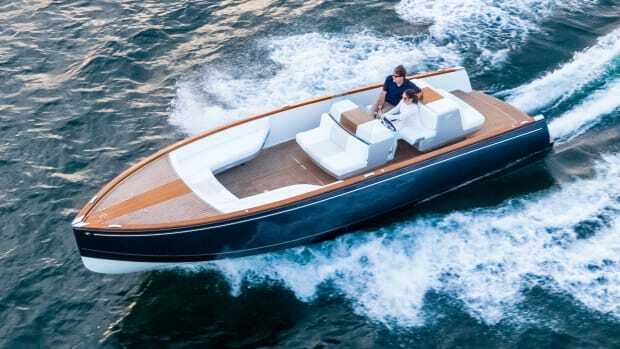 If anything, the Sport Boat demonstrates that Hinckley has range. I sea-trialed the boat in Rhode Island on a run from Porstmouth to Block Island with three 400-hp Mercury Racing outboards. 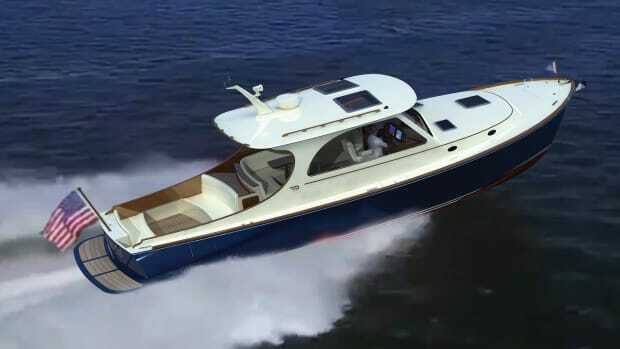 With a top speed of 47 knots and a cruise speed near 30 knots, the Hinckley ate up the bluewater miles between ports in well under an hour, and the ride in a 2-foot chop was incredibly comfortable. That’s in large part due to the offshore hull with 23 degrees of transom deadrise, which Hinckley says is one of the deepest in this segment. 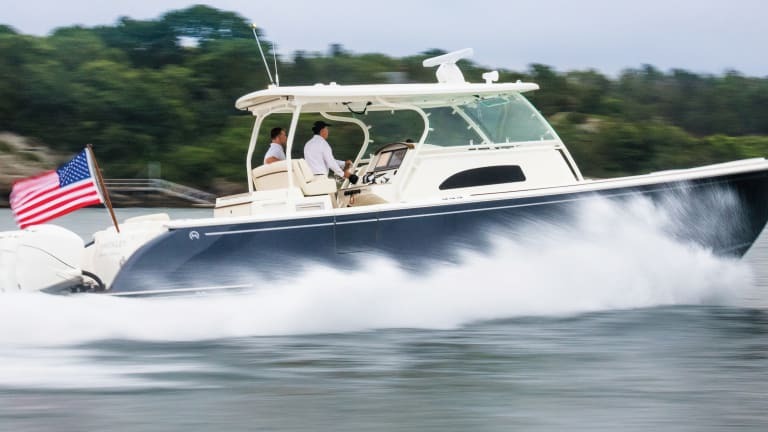 “A lot of other builders are putting outboards on existing hulls. 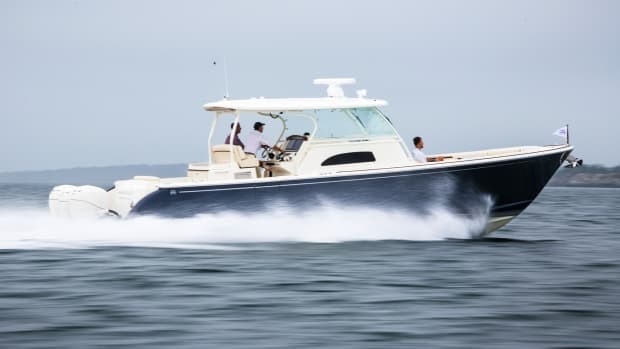 We’ve been working closely with Ray Hunt Design to create a boat from the ground up that is optimized for outboard propulsion,” says Scott Bryant, Hinckley’s vice president of product development and engineering. With an LOA of 42 feet, 7 inches and a 12 foot, 5 inch beam, there’s plenty of room for owners to get busy with the hobbies they enjoy most. If that’s fishing, there’s deck space to work lines from the cockpit and side decks, and the equipment list offers everything from a livewell and rod storage to carbon fiber outriggers. But that doesn’t mean you’ll see a lot of these boats trolling the tournament circuit. “The 40c isn’t a competition fishing rig that you try to take your family on. It is first and foremost optimized for creating the best possible experience for family and friends, although it can be fished aggressively if desired,” says Bryant. To deliver that best experience, Hinckley built the 40c with the refinement this brand is known for. 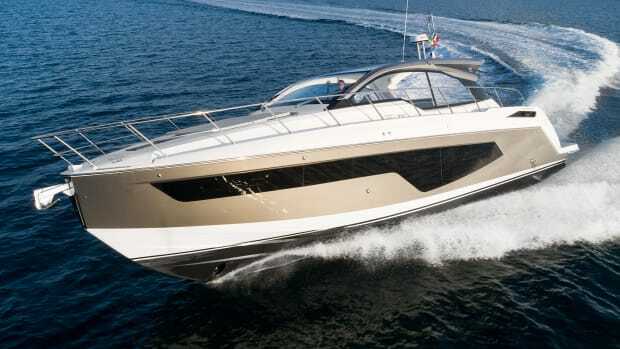 There are high-tech systems, including the Mercury Smart-craft package with joystick, digital throttle and shift and Skyhook that make handling as close to effortless as possible. 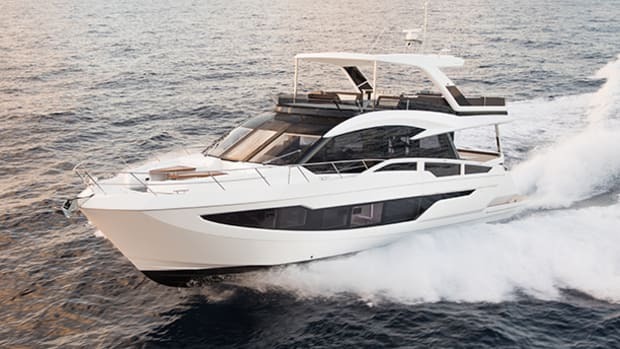 There are luxury comforts as well, including deep and comfortable lounges in the bow and one of the largest cabins you’ll find in a center console boat of this size. And there’s style. The 40c has modern lines that are just right for the young, active owners it was designed to appeal to, but there’s some Down East DNA here, too. And as I discovered, more than enough to turn heads on a busy dock in Block Island.